This is old version YouTube Gaming 1.4.41.5 apk for Android, you can install it if you want to downgrade or install old app. It is top Media & Video apps from Google Inc..
You can see other users playing similar game and learn their movement then you can ask for more solutions. It is like social media for game that incorporate sharing, comment, and give rating. To make live content, you just configure particular game account into this app then automatically go on air in no time. Users can subscribe to many channels about game and get information about popular video or most watched one. Game always attracts huge intention from people around the world. Developer creates this app as derivative model from standard video sharing application. As it mentioned above, users can get specific content about particular game without too much distraction so they can focus for playing and sharing. Another way to use this app is subscription and making channel. If you are good at prominent game, sharing on individual channel will make you popular. 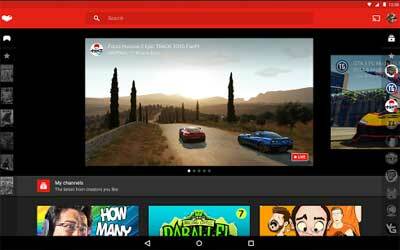 YouTube Gaming for android will make you skill on game better.